Update 12/22/15: Special Election Results Are In! Proposition Yes No Results What was the proposition about? 6.8% PASS To authorize the Board of Trustees to, in its discretion, complete or abandon the Plan of Merger and to approve of the Plan of Merger as presented. 10.5% PASS To approve of the amended Articles of Incorporation and Bylaws, which include the Solidarity Co-op and other changes. Thank you owners and staff for getting out the vote--1,544 is a record in the history of our Co-op! Owners, stay tuned to our information outlets for further details. Watch for next month's Central Register, or sign up for our e-mail newsletter, the Central Beet. But remember: Shopping at the Co-op tomorrow will be the same as shopping at the Co-op yesterday! The question of merger with Tacoma Food Co-op is whether or not we as owners authorize our Board to make a final decision regarding this matter; understanding that they will do their due diligence, and perform all of their legal duties prior to making this decision, understanding that they will not complete the plan of merger if it will have a negative impact on Central Co-op as it exists now. The second proposal put forward by the Board is a revision to our current Articles of Incorporation and Bylaws. If approved, they will change our co-op’s structure to that of a solidarity co-op with both consumer members and worker members; it will also enable us to offer our owners non-voting preferred stock. Both of these proposals are far-reaching in scope and will strengthen the regional economy and cooperative movement, with a dramatic impact on our immediate and long term future. We are fortunate as a Co-op to find ourselves in a moment of strength with visionary leaders, dedicated workers and owners, and enough financial stability to propose these empowering changes. Our hope is that you, our owners, will support this vision, and remember the day that you were a part of voting for these changes that we believe will have an amazingly positive impact on the livelihoods of thousands of workers, producers, farmers, and households throughout our region. Over almost 40 years we have strengthened our community and become the great co-op that we are today; we hope that beginning in 2016 we will build even further upon all of our collective achievements and spread the wealth of cooperation to an ever larger cooperative community. We ask that you take some time over the coming weeks to consider these proposals and then cast your vote on them. There will be information sessions on Saturday, December 12 and Monday, December 14; please RSVP to conversation@centralcoop.coop for additional details. Our election ends online and in-store on Sunday, December 20, and you can also vote at our Special Owner Meeting on Monday, December 21 between 6:30pm and 7pm (RSVP information below). Please keep an eye out for printed Voter Guide booklets in the store and your mailbox in the coming weeks. Thank you for your support, and thank you for voting! Proposal No. 1: To authorize the Board of Trustees to, in its discretion, complete or abandon the Plan of Merger and to approve of the Plan of Merger as presented. Otherwise, the Board of Trustees will abandon and terminate the Plan of Merger before it becomes effective. Proposal No. 2: To approve of the amended Articles of Incorporation and Bylaws. Changes to the structure of the Board of Trustees to provide for representation by three members of each of the worker class and consumer class of members, as well as to add the executive president as a voting ex-officio member of the Board of Trustees and to give the Board of Trustees discretion to appoint two additional members as trustees. In the event of a merger or similar action, the Board would be authorized to appoint up to two other members temporarily from the merged company. 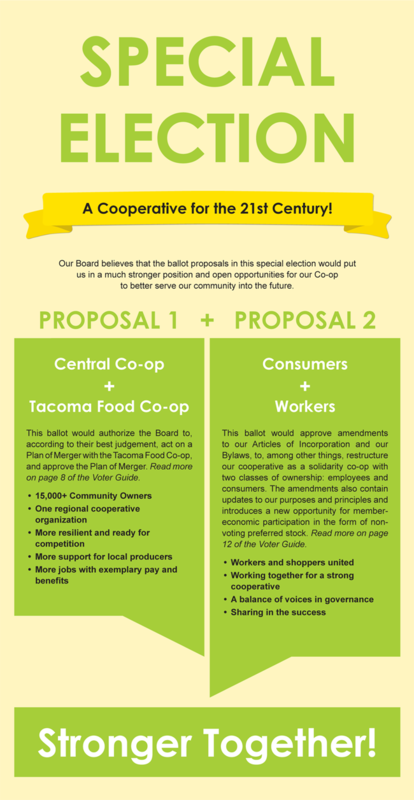 Q: Why is our Board of Trustees considering a merger with Tacoma Food Co-op? Q: What is a merger? Q: How would Central Co-op benefit from merging with another Co-op? Q: Why merge with the Tacoma Food Co-op? Q: Why not just open another Seattle location? Q: If the vote passes, will the merger happen immediately? Nope! Central Co-op’s Board of Trustees is asking you to authorize them to formally complete or abandon the Plan of Merger, and to approve the plan of merger as presented. If the majority of voters vote yes to the authorization, then the Board would hold their own vote on the proposal. The Tacoma Food Co-op has a similar process in place which must succeed in order for this to happen. Provide for local voices in each geographic area of operation to be heard and considered in decision making by the co-op. Q: How does Tacoma Food Co-op feel about this idea? Q: If we were to merge, how would my experience as a Seattle Central Co-op owner change? Q: Will our name change? Q: Will this impact the compensation and benefits of the Tacoma Workers? Q: What happens to the Tacoma Board? Q: What will happen to the members of the Tacoma Food Co-op? Q: Will any jobs be lost? Q: Is Tacoma a Union shop? Q: Would a merger affect the status of union workers at Central Co-op in Seattle? Q: What will happen to investment at 1600 E. Madison? Q: How does the decision process work on a plan of merger? Q: What is a solidarity co-op? Q: Why is it good for Central Co-op? Q: How would ownership of the Co-op be split? Q: Where did the Board get the idea? Q: How would this impact the management structure of the Co-op? Q: What would a change to the solidarity model mean for employees? Increased democratic representation in the governance of the Co-op. Greater opportunity for equity in the business and financial benefits of ownership. Q: Does this mean that there will be consumer-owners volunteering in the store? Q: Who would be eligible to be an employee-owner? Q: Would all employees have to be owners? Q: Would prices increase because of this change? Q: How does the solidarity structure affect the composition of the Board? Weaver Street Market in North Carolina is the only existing worker-consumer grocery co-op with membership in National Cooperative Grocers and has a structure very similar to what we are proposing. Using their structure as a starting point, worker owners and consumer owners would be elected to the Board with composition balanced between the two ownership classes. A full board will have three trustees elected from the worker-class, three trustees elected from the consumer class, the chief executive of the Co-op, and two board appointees from the consumer class. Current sitting trustees shall fill out their full elected terms on the board. In the future, one consumer and one worker will be elected each year. All owners, whether worker or consumer will have the right to vote for all elected trustees. Q: Can you explain the timing of the Special Election? Q: How would patronage change under the new Articles and Bylaws? Q: What is Preferred Stock? Q: Why did the Board amend the Co-op’s organizational purpose in the Articles? Q: What will be the structure of the Nominating Committee? Q: What officer positions will the new Board have? Q: Is Central Co-op going “Corporate”? Q: How is the change to a solidarity structure related to the proposed merger, and why are we voting on them at once? Members are or may be entitled to dissenter’s rights with respect to Proposal No. 1. Any member or shareholder electing to exercise such right of dissent shall file with the corporation, prior to or at the meeting of members and shareholders at which such proposed corporate action is submitted to a vote, a written objection to such proposed corporate action. If such proposed corporate action be approved by the required vote and such member or shareholder shall not have voted in favor thereof, such member or shareholder may, within ten days after the date on which the vote was taken, make written demand on the corporation, or, in the case of a merger or consolidation, on the surviving or new corporation, domestic or foreign, for payment of the fair value of such member's membership or of such shareholder's shares, and, if such proposed corporate action is effected, such corporation shall pay to such member, upon surrender of his or her membership certificate, if any, or to such shareholder, upon surrender of the certificate or certificates representing such shares, the fair value thereof as of the day prior to the date on which the vote was taken approving the proposed corporate action, excluding any appreciation or depreciation in anticipation of such corporate action. Any member or shareholder failing to make demand within the ten day period shall be bound by the terms of the proposed corporate action. Any member or shareholder making such demand shall thereafter be entitled only to payment as in this section provided and shall not be entitled to vote or to exercise any other rights of a member or shareholder. (4) A court of competent jurisdiction shall determine that such member or shareholder is not entitled to the relief provided by this section. Within ten days after such corporate action is effected, the corporation, or, in the case of a merger or consolidation, the surviving or new corporation, domestic or foreign, shall give written notice thereof to each dissenting member or shareholder who has made demand as herein provided, and shall make a written offer to each such member or shareholder to pay for such shares or membership at a specified price deemed by such corporation to be the fair value thereof. Except in cases where the fair value payable to dissenters is fixed in the articles of incorporation or pursuant to RCW 24.06.255, such notice and offer shall be accompanied by a balance sheet of the corporation in which the member holds his or her membership or the dissenting shareholder holds shares, as of the latest available date and not more than twelve months prior to the making of such offer, and a profit and loss statement of such corporation for the twelve months' period ended on the date of such balance sheet. If the fair value payable to dissenting members or shareholders is fixed in the articles of incorporation or pursuant to RCW 24.06.255, or if within thirty days after the date on which such corporate action was effected the fair value of such shares or membership is agreed upon between any such dissenting member or shareholder and the corporation, payment therefor shall be made within ninety days after the date on which such corporate action was effected, upon surrender of the membership certificate, if any, or upon surrender of the certificate or certificates representing such shares. Upon payment of the agreed value the dissenting member or shareholder shall cease to have any interest in such membership or shares. If the fair value payable to dissenting members or shareholders is not fixed in the articles of incorporation or pursuant to RCW 24.06.025, and within such period of thirty days a dissenting member or shareholder and the corporation do not so agree, then the dissenting member or shareholder shall be entitled to make written demand to the corporation, within sixty days after the date on which such corporate action was effected, requesting that the corporation petition for a determination of the fair value by a court. If such a demand is not timely made on the corporation, the right of such member or shareholder to demand to be paid the fair value of his or her membership or shares shall be forfeited. Within thirty days after receipt of such a written demand from any dissenting member or shareholder, the corporation shall, or at its election at any time within ninety days after the date on which such corporate action was effected may, file a petition in any court of competent jurisdiction in the county in this state where the registered office of the corporation is located praying that the fair value of such membership or shares be found and determined. If, in the case of a merger or consolidation, the surviving or new corporation is a foreign corporation without a registered office in this state, such petition shall be filed in the county where the registered office of the domestic corporation was last located. If the corporation shall fail to institute the proceeding as herein provided, any dissenting member or shareholder may do so in the name of the corporation. All dissenting members and shareholders, wherever residing, shall be made parties to the proceeding as an action against their memberships or shares quasi in rem. A copy of the petition shall be served on each dissenting member and shareholder who is a resident of this state and shall be served by registered or certified mail on each dissenting member or shareholder who is a nonresident. Service on nonresidents shall also be made by publication as provided by law. The jurisdiction of the court shall be plenary and exclusive. All members and shareholders who are parties to the proceeding shall be entitled to judgment against the corporation for the amount of the fair value of their shares. The court may, if it so elects, appoint one or more persons as appraisers to receive evidence and recommend a decision on the question of fair value. The appraisers shall have such power and authority as shall be specified in the order of their appointment or an amendment thereof. The judgment shall be payable only upon and concurrently with the surrender to the corporation of the membership certificate, if any, or of the certificate or certificates representing such shares. Upon payment of the judgment, the dissenting shareholder or member shall cease to have any interest in such shares or membership. The judgment shall include an allowance for interest at such rate as the court may find to be fair and equitable in all the circumstances, from the date on which the vote was taken on the proposed corporate action to the date of payment. The costs and expenses of any such proceeding shall be determined by the court and shall be assessed against the corporation, but all or any part of such costs and expenses may be apportioned and assessed as the court may deem equitable against any or all of the dissenting members and shareholders who are parties to the proceeding to whom the corporation shall have made an offer to pay for membership or shares if the court shall find that the action of such members or shareholders in failing to accept such offer was arbitrary or vexatious or not in good faith. Such expenses shall include reasonable compensation for and reasonable expenses of the appraisers, but shall exclude the fees and expenses of counsel for and experts employed by any party; but if the fair value of the memberships or shares as determined materially exceeds the amount which the corporation offered to pay therefor, or if no offer was made, the court in its discretion may award to any member or shareholder who is a party to the proceeding such sum as the court may determine to be reasonable compensation to any expert or experts employed by the member or shareholder in the proceeding. Within twenty days after demanding payment for his or her shares or membership, each member and shareholder demanding payment shall submit the certificate or certificates representing his or her membership or shares to the corporation for notation thereon that such demand has been made. His or her failure to do so shall, at the option of the corporation, terminate his or her rights under this section unless a court of competent jurisdiction, for good and sufficient cause shown, shall otherwise direct. If membership or shares represented by a certificate on which notation has been so made shall be transferred, each new certificate issued therefor shall bear a similar notation, together with the name of the original dissenting holder of such membership or shares, and a transferee of such membership or shares shall acquire by such transfer no rights in the corporation other than those which the original dissenting member or shareholder had after making demand for payment of the fair value thereof.